Frequently, you may create NEW Infusionsoft Tags or Store Products or Categories that you would like to associate with each other with Revenue Conduit. 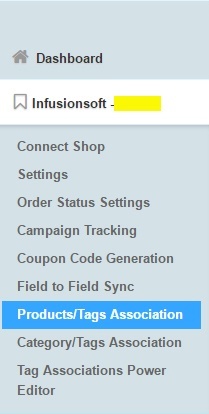 In this article we explain how to Refresh your Store Products/Categories and Infusionsoft Tags inside of Revenue Conduit's Admin Interface. In the Top Right of the screen, click Refresh Products (or Refresh Categories if you're in the Category/Tags Association screen) so that Revenue Conduit requests a list of your most up-to-date Products and Categories from your Store.NOTE: You may need to wait a few minutes and refresh the page to see the tag created and associated with the Product or Category you selected. If neither of those work, please Logout of Revenue Conduit and then log back in, again. In the Top Right of the screen, click Refresh Tags so that Revenue Conduit requests a list of your most up-to-date Infusionsoft Tags from your Infusionsoft app.NOTE: You may need to wait a few minutes and refresh the page to see the tag created and associated with the Product or Category you selected. If neither of those work, please Logout of Revenue Conduit and then log back in, again.